Cross the equator on two wheels! Arrive in Nairobi and we are met by our local crew who transfer us to our hotel. You get to meet your Kawasaki KLR650 and I suggest giving her a name for it will be you both going on this mini journey through the best of Africa. 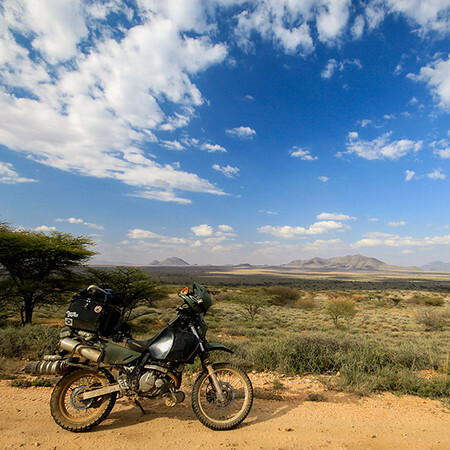 I’ll give you some pointers on what it takes to successfully ride a motorcycle in Kenya and our local guides will teach you a few words in Kiswahili that will help bridge the gap when interacting with the locals. We set off from Nairobi and head north past Thika and the Blueposts Chania Falls. We pass the towns of Nyeri and Naromoru where we lunch on some trout. Mt. Kenya is on our right and we head a bit further up to Kongoni Camp at Nanyuki. Get up early in the morning and come for a sunrise hike around the flanks of Mt. Kenya, the second highest mountain in Africa. We ride down towards the Aberdares range of mountains and lunch at the colonial-era Aberdare Country Club before heading on to Nyahururu for the night. From Nyahururu, it’s an easy ride for a bit and then it’s some fun off-roading to Lake Bogoria. From the Lake Bogoria, we get back on the pavement for a quick visit to Lake Baringo and then head west to Eldoret via the Tugen hills. After lunch, we ride the fun Eldama Ravine road before heading for the Kericho Tea Hotel. Chai is now very much a Kenyan drink thanks to the long influence of Indians here. From Kericho, we shift down from the hills and head for the savannahs of the Maasai Mara. Our luxury camp at Olumara makes for a perfect base to explore this world famous game park. Interested in a night walking safari? A day off the bikes to fully experience the Maasai Mara. We head on a game drive and you can shoot, only with an SLR, all the Wildebeest and other big game in this wild playground. The Wildebeest Migration is one of the greatest spectacles in the natural world with some 2 million Wildebeest crossing the Mara River with deadly crocodiles picking them off. The lions and other big cats become lazy as food is plenty at this time of the year. But don’t get too close! We leave the Mara and head through Narok towards Lake Naivasha. Mt Longonot, an extinct volcano, looms nearby and dominates the landscape as it stands alone in the Great Rift Valley. Enjoy a boat ride on the lake to Crescent Island. From Naivasha, we climb up the escarpment with stunning views of the Rift Valley and Mt Longonot. Passing through Ngong Hills, we get to the end of the journey as we reach Nairobi. After saying goodbye to your KLR, we celebrate the epic ride with a feast at Carnivore, where you sink your teeth into endless steaks of crocodile, ostrich and perhaps a giraffe. Get dropped off at the airport for your international flight home.